MDP is providing full MEP services for the Greystar Apartments, a new construction, 16 story apartment building in Denver, CO. 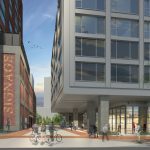 The building will contain retail and restaurant space, as well as above-ground parking serving the 300 residential units above. There will be a mix of studio, one, two, and three bedroom units as well as 12,000 sq. ft. of amenity space.